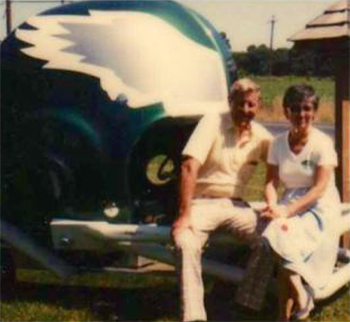 Shirley Wunsch and her husband Al, sitting on a custom “Eagles Helmet Golf Car”. This picture was taken outside their Golf Car business in the late 70’s. Shirley has been a Philadelphia Eagles fan for quite some time. She attended Super Bowl XV in New Orleans, January 1981, when the Eagles lost to the Oakland Raiders. Tickets for the Super Bowl in 1981 were $40.00. 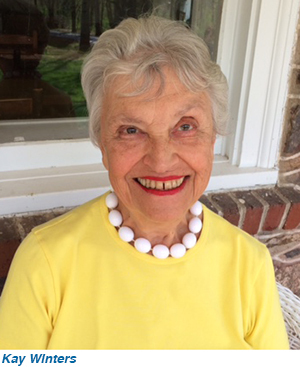 Shirley waited 24 more years to watch Super Bowl XXXIX in Sydney, Australia when again her beloved Eagles lost to the New England Patriots in 2005. She will be rooting on her Eagles once more 13 years later during Super Bowl LII when they square off against the Patriots again. This time, hopefully, she will witness history being made from the comfort of her Pine Run apartment as the Philadelphia Eagles BEAT the New England Patriots! We know a wonderful, loving, special man, who puts the needs of others before himself. 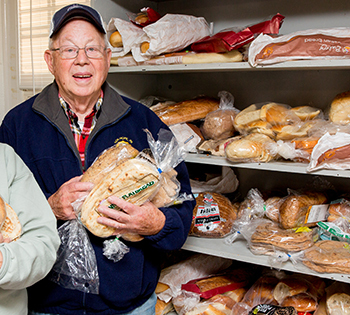 That round container that collects food for the less fortunate in this community (it’s across from the concierge desk) is taken weekly to the Baptist Church Food Larder on Butler Avenue, New Britain, by our Villager of the Month of February, Bill Kurz. He has been doing this for 15 years! Bill likes Pine Run for its food both in the Cafe and at The Cottonwood. He loves looking out on Green Road, experiencing nature: the birds, deer, the lovely view and beautiful woods. We wish him many more happy and healthy years at Pine Run. I have always been an optimist. Celebrated rainbows, snowflakes, the Spring, sounds of tree frogs. 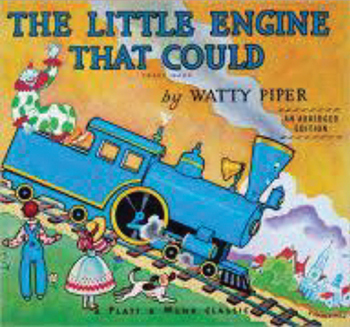 As a child my favorite book was The Little Engine That Could. I wanted to read again and again how against all odds, the little train would chant, I think I can… I think I can, and climb the mountain to get to the other side. When the dreaded day came and the operation was over, the lump WAS benign. I knew it! I crowed. I had a hoarse and raspy voice like a person making an obscene phone call, but the doctor assured me, my voice would come back. At home I was glad to snuggle down beneath the patchwork quilt, push back the January gloom with bright blooms, cheerful cards, phone calls, handmade books from children at school, food, wine, and good cheer supplied by close friends who came to support Earl and me. Each morning I would wake and say hello, hello, hoping to hear my voice. Only a sliver of sound came out. After a month with no improvement, I went back to the doctor. He looked down my throat with a mirror, and shook his head. The nerves are damaged. You have a paralyzed vocal chord. I’m sorry but there’s nothing to be done. You have all the voice you’re going to get. Earl had to push me out the door. The thought of going back to my job as elementary supervisor in four schools with only a whisper, was mind boggling. I knew my days as a part time college instructor and consultant for the American International Schools had ended. I tried to be cheerful and brave and have those attributes sunny handicapped people have in movies. On the outside, I smiled, but inside I felt my world had collapsed. Communication was who I was. Now at the store, saying “three pounds of seafood salad” so it could be heard, was almost impossible. Nine months passed. No change. Then I met a kindergarten teacher from another district. She also whispered. She had had the same operation. But her whisper was louder and stronger than mine. We compared notes. 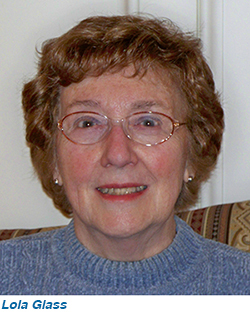 “Go see Renee Blaker, a speech pathologist from Doylestown. If anyone can help you…she’s the one.” I called Renee the next morning. “I’ll need a doctor’s prescription,” she said. We made an appointment. The doctor snorted at the idea of speech therapy. It won’t do any good. Waste of time. he said. Teflon surgery would be a better bet. “I want to try,” I insisted. He sighed, and signed the paper reluctantly. It was December. As I drove home, the first snowflakes whirled on the windshield and I thought I heard a little voice in my head say… I think I can… I think I can. I started with hard vowels; any, every, each, out, and moved on to phrases; alter the arbor, etch a sketch. Five times a day for 15 minutes I said them week after week. My voice still whispered. However, being able to take some action felt like partial control. I’ve always believed in the power of visualization. Every day while pushing out those phrases, I imagined standing in front of the school auditorium packed with parents, speaking loudly and clearly. January, February, March… Now I was up to sentences; It’s odd that Arthur’s not at Eileen’s tea. I said so often Earl would sometimes get into bed saying… “It is odd about Arthur.” April, May June… No change. Sentences turned into paragraphs. Still, I practiced. When we sailed on the Chesapeake or Lake Nockamixon, my words wouldn’t carry. The wind would whip my whisper away. Some days, when I went for speech therapy, I just cried. We didn’t do sentences. Renee and I talked. She understood I had to mourn my loss before I could move on. Her staunch belief that I could retrieve my voice gave me courage to continue. And then it was Labor Day. Time for another school year. Teachers said, “Oh… you sound stronger.” I thought maybe I did, but I wasn’t sure. November. Time to welcome my reading volunteers at the Bridgeton School. The auditorium was full. The audience got very quiet. I picked up the microphone. “Welcome…” I said… Out came my voice! I couldn’t believe it. People rushed up to give me a hug. After all that practice… and my mental picture of speaking in public and being heard. It happened! I still had a paralyzed vocal chord but the other one had moved closer and was working for two. I felt as if I got my life back. All that practice, support from my husband, friends, colleagues, and the caring competence of an outstanding speech pathologist paid off. 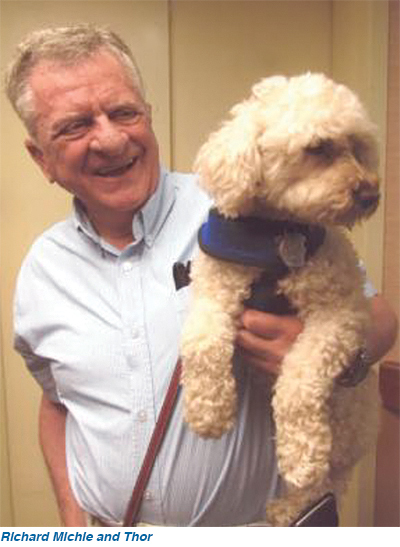 A happy-go-lucky guy with a lovable dog. If you’re having a bad day, you instantly feel better in his company. If you’re discussing your aches and pains, you feel better after talking to him. He’s better than Aleve!! Our villager for the month of October is jovial Richard Michie. Richard was born and raised in a row home on North 18th Street in Philadelphia. Among his early recollections were of his dad, an air-raid warden, and the curtains being closed when the air-raid sirens sounded and to this day, remembers ration books. In the back of his house was an alley where many merchants passed through selling fresh ground horseradish, and other merchants sharpened knives. Richard attended Germantown Friends elementary school. While there, he went on a bus trip to pick milkweed for the war effort. Sadly, at 8 years of age, his mom passed away. His dad decided to send him to Pennington Prep, a boarding school where he started second grade. His dad frequently visited him, and they often shared dinner together. 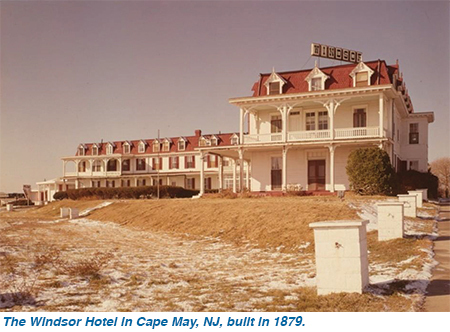 During summer months, Richard lived with his dad at the Manufacturers’ Country Club in Oreland, and part of the summer went to Camp Lenape in the Poconos. He also spent some time in the summer with his aunts, his dad’s sisters, and grandparents in Jenkintown. Richard attended Pennington Prep until the 6th grade. When he was 13, Richard’s dad remarried. He really got to know his birth mom through many conversations with his stepmother, who had gone to school with his mom. Soon they moved to a home in East Falls, Germantown, near Penn Charter School. Richard continued his schooling there, graduating in 1956. Having enough sense to know that he wasn’t sure what he wanted to do in the future, he decided to join the Naval Air Reserve, requesting immediate active duty. He went through Bainbridge Maryland Boot Camp, and was assigned to an S2F Squadron in Quonset Point, Rhode Island, serving as an Aviation Storekeeper. Half of his time he spent on land, and half the year he traveled on the Aircraft Carrier, USS Leyte CVS-32. While on ship he was able to visit England, Lisbon, Portugal, Athens Greece, Rhodes, and Gibraltar. After 2 years of active duty, he went into the Inactive Reserve. He started college, originally known as Philadelphia Textile Institute, which became Philadelphia College of Textiles and Science, then Philadelphia University, and now a part of Jefferson. 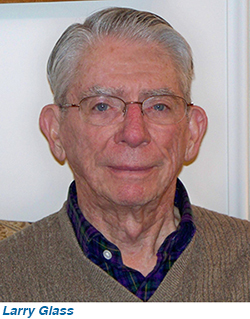 In 1962, he graduated with a degree in Management and Marketing. Afterwards, Richard went into the family business, textile manufacturing, started by his grandfather. 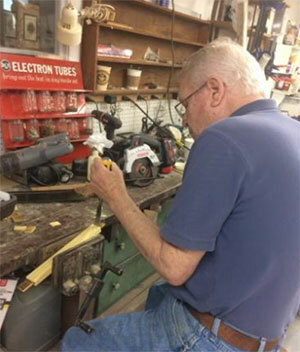 Richard was involved in production and plant maintenance. The company, Andrew Y. Michie and Sons, produced textile interlining for the men’s tailored clothing industry. In 1964, the company began manufacturing a replacement for horsehair cloth. The new division of the company became known as Mitchie Textiles, Inc.
Richard has three wonderful children from his first marriage of ten years. 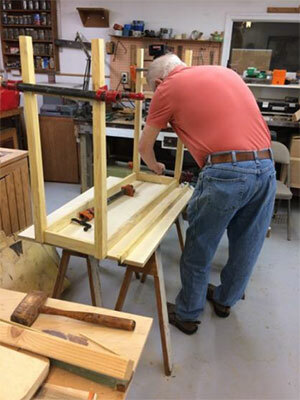 The second time around, he decided he only wanted to raise, as he puts it, “four-legged kids”, and started a hobby raising, and showing, Shetland sheepdogs. At the same time, he developed an interest in Jaguar sports cars. Soon he joined a local Jaguar Club where he raced cars, as well as participated in Car shows. In February, 2016, Richard moved to Pine Run. He loves to walk, and walks his dog, Thor, even in bad weather. Richard loves to eat, and the food here being better than he expected, he does eat! Consequently, like many of us at Pine Run, he has to watch his weight. Richard looks forward to many more years at Pine Run. In last month’s issue of the Voice, I described how Irv Thompson, assisted by Tom Swartz, was giving a new life to the Yellowwood Tree that was cut down from its years and years standing tall in the Yellowood Cluster. Holding up Irv’s work, was a defective switch operating the table saw. The switch had to be replaced. 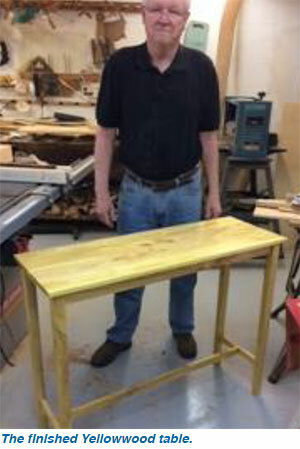 Well, the necessary part finally arrived and Irv was able to continue fashioning the various pieces that make up the table, such as the table legs and the tabletop as shown below. Then the pieces all had to be put together, sanded and a finish applied. The handsome table is on display in Villager Services. For the past 13 or so years, Bobby and I have been members of the Mercer Museum and we try to attend all of their opening receptions. Well, Friday, May 12, was no exception. 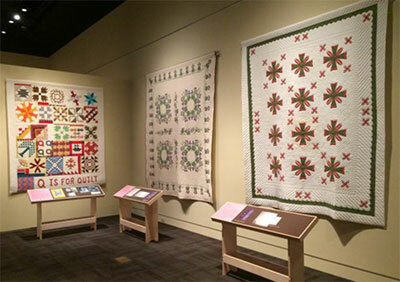 The exhibit preview reception featured the Mary Schafer Collection: A legacy of Quilt History, and, Small Worlds: The Sharon Holloway Dollhouse and Miniatures Collection. To our pleasant surprise, Pine Run was a major exhibit sponsor. 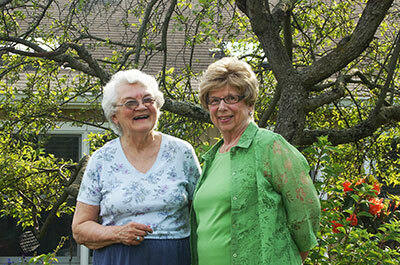 Barbara Chierici, Pine Run Sr. Director Sales and Marketing was there along with Villagers, Bill and Mary Lieser, Carole Scanlon, Carol Ann Thomas, Barbara Molesworth and Marianne Gilmour. An additional treat was that Sharon Holloway (whose miniature collection was featured) will be a Pine Run Villager this June. 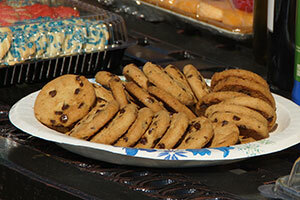 We all enjoyed the wonderful refreshments catered by Chambers 19 of Doylestown and the fabulous exhibit. I hope you can get to see the exhibit. Shown are some scenes to heighten your interest. 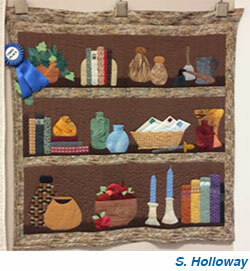 Sharon Holloway will join us this month as a Pine Run Villager. 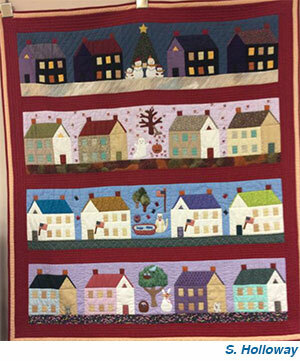 If you can’t get to the Mercer, you can see beautiful quilts created by Sharon in our auditorium. “June is bustin’ out all over…”. This song from Rogers & Hammerstein’s “Oklahoma”, doesn’t take much of your imagination to see how it might pertain to gardening. To assure “bustin’ out” in your beds and borders, get your hands on some organic plant food the first fine day in June and scatter it about your “bustin’ out” perennials and flowering shrubs and stand back and wait for the show! Here at Pine Run, we are particularly blessed to have some terrific plantings of hydrangea shrubs. These beds with their big “mophead” blooms are enough to take your breath away each summer. Many of the Pine Run plantings of hydrangea tend to be blue flowering, but did you know that it doesn’t take too much effort to convert that blue blast to a pink one? The trick lies in the soil acidity and, of course, I’m sure that you’ve also noticed white flowering hydrangeas. The white flowering beauties happen to be a different species from the blue/pink flowering types and with them we are stuck with white – no way to switch. Soil ph is generally found to be in a range from 0 to 14 with 7 being neutral. A ph below 7 means an acidic soil and above 7 would be alkaline. 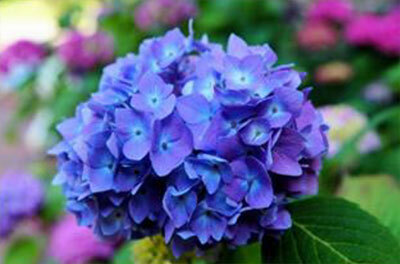 Alkaline soils produce pink blooms in hydrangeas and acidic soils produce blue hydrangeas. Changing the ph of your soil is done simply by adding lime to make it more alkaline or aluminum sulphate to make it more acidic. I am advising that if one desires to change the soil ph, it won’t happen overnight, but perhaps a year or two to really affect a difference. I was so proud I had perfected my backflip over the back of our living room couch. It involved getting my mouth fixed just right, gathering momentum, doing a short run, digging my head and hands into the soft couch cushions, then flipping my legs up and over the hard back of the couch and crashing to the floor on the other side, then emerging to the applause of the handsome young men in their Air Force blue uniforms I was trying to impress. My mother was mortified. Here was her seven-year old daughter showing off her waving skinny legs and mended underwear to her young male guests. To me they were a grown-up adult audience to impress. To my father they were the scared, 17 year old boys he had brought home after Sunday evening service to experience a bit of home away from home comfort before he drove them back to the central flying school about 4 miles away. Dad’s car was one of the only six or seven which were allowed to be driven in our 1940s wartime, peaceful English, Cotswold Village. My father kept a visitor’s book in which he wrote down their names and the date of their visit and beside it was the date of their death. It was the time of the Blitz over London. 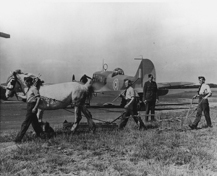 Boys straight out of school were being trained to fly Spitfires, to shoot down German planes and kill German pilots. It took six weeks to train them. Their life expectancy was three weeks! Earlier, in the afternoon of that same day, my mother and I walked to our cheerful church hall to serve tea, hand out cigarettes and sing hymns; same tune, different words, with our other guests. They were German pilots, now prisoners of war shot down by our young pilots while on bombing raids over the south of England. Most of them were older men and some had learned to fly in the First World War – the war to end all wars. During the week they were transported in army trucks from the POW camp and dropped off in twos and threes at farms around the countryside. The farmers were glad to have the labor as their sons were off learning to kill Germans. The prisoners were happy, they loved the countryside, they knew that they would love to go home to their families when the war was over. They missed their families and they enjoyed coming to the church because it reminded them of their blonde daughters back home. I thus learned a lesson at an early age about the irony, tragedy and stupidity but, sometimes, the necessity of war. Summer Fun in the Clusters! 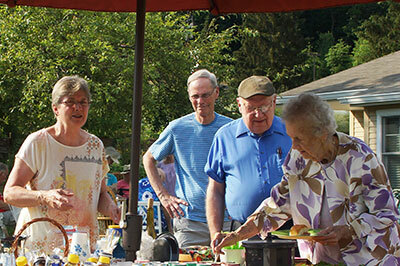 Neighbors in Redwood and Quince enjoyed a convivial afternoon gathering on Sunday, June 19. 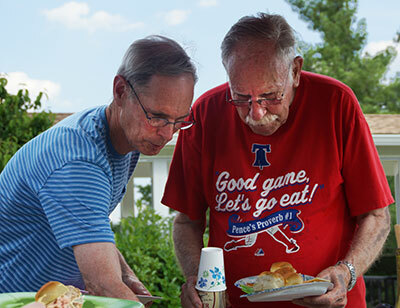 They gathered chairs under the shade of a tree for conversation, sandwiches, iced beverages, baked treats, and creamy ice cream bars that helped keep everyone cool!